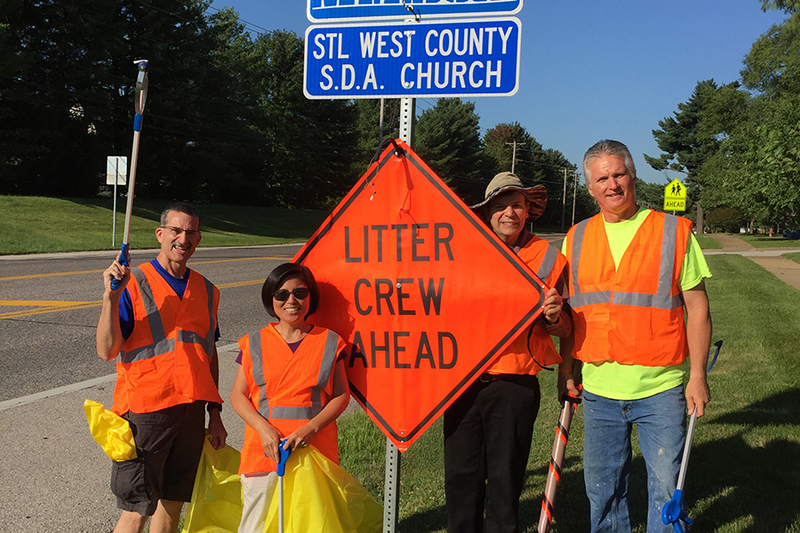 A one-mile stretch of Wildhorse Creek Road in Chesterfield, Missouri, is clean and beautiful thanks to the dedicated efforts of local church member Jason Matthews and a team of volunteers. Jason appealed to the Department of Transportation for the St. Louis Metropolitan area two years ago and got permission for the West County Church to keep the area clean. Through sleet and snow, heat and humidity you will find church members volunteering their Sunday mornings, getting their exercise in by cleaning up trash along the highway. Interesting items have been discovered such as a debit card (the owner was contacted and grateful for it being returned), coins, a socket wrench and an old rusty file cabinet with a family of opossum living in it (mother opossum wasn’t too happy to meet the crew—the filing cabinet was left in place for now). This is a wonderful way to serve a community and share witness. Residents often thank the volunteers as they pass by.